It looks like we've come full circle. 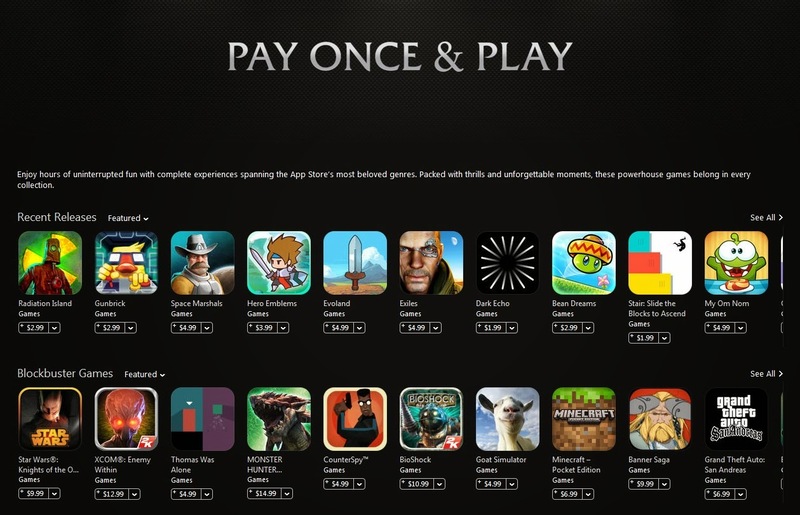 Apple is now advertising games that are "Pay Once and Play." It's so weird that we have to come up with a term to talk about games you buy once and then play forever. Every game used to be that way, but in this world of crazy amounts of DLC and in-app purchases it is no longer the norm. I'm actually happy to see this. It's finally a backlash against the predatory in-app purchase model that so many games seem to take. Not all in-app purchase models are bad, I don't hate them categorically. But some of the games out there might as well be slot machines. They're the ones giving gaming a bad name right now. When DLC or in-app purchases are done correctly, they can be great. But when they're done poorly they can just be there to take peoples' money. I hope Apple keeps promoting games like this. Maybe it will help draw some attention away from the "games" that are only there to take your money.